A portmanteau (/pɔːrtˈmæntoʊ/ ( listen), /ˌpɔːrtmænˈtoʊ/) or portmanteau word is a linguistic blend of words, in which parts of multiple words or their phones (sounds) are combined into a new word, as in smog, coined by blending smoke and fog, or motel, from motor and hotel. In linguistics, a portmanteau is defined as a single morph that represents two or more morphemes. In then-contemporary English, a portmanteau was a suitcase that opened into two equal sections. The etymology of the word is the French porte-manteau, from porter, "to carry", and manteau, "cloak" (from Old French mantel, from Latin mantellum). In modern French, a porte-manteau is a clothes valet, a coat-tree or similar article of furniture for hanging up jackets, hats, umbrellas and the like. An occasional synonym for "portmanteau word" is frankenword, an autological word exemplifying the phenomenon it describes, blending "Frankenstein" and "word". Some city names are portmanteaus of the border regions they straddle: Texarkana spreads across the Texas-Arkansas border, while Calexico and Mexicali are respectively the American and Mexican sides of a single conurbation. A scientific example is a liger, which is a cross between a male lion and a female tiger (a tigon or tiglon is a similar cross in which the male is a tiger). "Jeoportmanteau!" is a recurring category on the American television quiz show Jeopardy!. The category's name is itself a portmanteau of the words "Jeopardy" and "portmanteau." Responses in the category are portmanteaus constructed by fitting two words together. 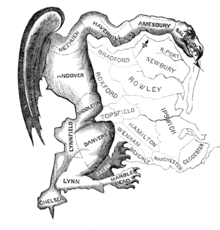 Portmanteau words may be produced by joining together proper nouns with common nouns, such as "gerrymandering", which refers to the scheme of Massachusetts Governor Elbridge Gerry for politically contrived redistricting; the perimeter of one of the districts thereby created resembled a very curvy salamander in outline. The term gerrymander has itself contributed to portmanteau terms bjelkemander and playmander. Oxbridge is a common portmanteau for the UK's two oldest universities, those of Oxford and Cambridge. In 2016, Britain's planned exit from the European Union became known as "Brexit". David Beckham's English mansion Rowneybury House was nicknamed "Beckingham Palace", a portmanteau of his surname and Buckingham Palace. A company name may also be portmanteau (e.g., Timex is a portmanteau of Time (referring to Time magazine) and Kleenex) as well as a product name (e.g., Renault markets its Twingo, a combination of twist, swing and tango). For the Disney film Big Hero 6, there is a location called "San Fransokyo", a fusion between San Francisco and Tokyo. إيش (ʔēš, what), from أي (ʔay, which) and شيء (šayʔ, thing). متشائل[pronunciation?] ("mutashaʔim", pessimist) and ("mutafaʔil", optimist), the title of a novel published by Emile Habibi in 1974. The title is translated in English to "The Pessoptimist." In the Bulgarian language, the most common use of portmanteau (in Bulgarian: "портманто" [portmanto′]) is as a word describing a typical furniture for a vestibule in an apartment. It is a coat hook together with a shoe cabinet below it upon which you can leave your belongings such as keys, hat, scarf, gloves, handbag, etc. In Bulgarian this word is not used to describe a blend of words as it is in English, although this linguistic phenomenon is seen here as well. You can also find new terms in Bulgarian formed by binding two words. Some of them are invented for the sake of advertising campaigns. One such example is the word gintuition (джинтуиция pronounced dzhintuitsia), which is made up from the words gin and intuition. This one, in particular, is used, not surprisingly, as a part of a gin commercial. Another example is the word charomat, which consists of the words чар (the Bulgarian word for charm) and аромат (meaning aroma), made popular by an ad about a coffee brand. The name of a common Filipino mongrel dogs askal is derived from Tagalog words "asong kalye" or "street dog" because these dogs are commonly seen in streets. Askals are also called "aspins", a combination of "asong Pinoy" or "Philippine Dog". Many Filipinos are very fond of speaking in Tagalog with some English words and thus are actually speaking in Taglish, a form of code-switching. Despite its French etymology (modern spelling: portemanteau), portmanteau is not used in French in this context. It is indeed a false friend. It refers to a coat stand or coat hook (literally a "coat support"), but in the past, it could also refer to a cloth drape knights would use to pack their gear. It was in this context that it first came to its English use, and the metaphorical use of a linguistic phenomenon (putting one word inside another, as into a case) is an English coinage. The French linguistic term mot-valise, literally a "suitcase-word", is a relatively recent back-translation from English, attested only since 1970. Although French of France is regulated by the Académie française (which has had a conservative attitude to neologisms) it produced a number of portmanteau words such as franglais (frenglish) or courriel (courrier électronique = email) and has used the technique in literature (Boris Vian) or to create brands: Transilien (Transports franciliens = Île-de-France transportation system). French in Canada has a second regulatory body, named the Office québécois de la langue française (OQLF), an agency of the Government of Quebec, which is independent of the Académie. It has a tendency to produce neologisms in order to replace anglicisms. It created the portmanteaus courriel (e-mail) from courrier (mail) and électronique (electronic), and clavardage (chatting) from clavier (keyboard) and bavardage (chatter), for example. 'Teuro', combining 'teuer' (expensive) and 'Euro'. Kreuzkölln, the Berlin area bordering between Kreuzberg and Neukölln. 'Jein' is a widely used contraction of 'Ja' (yes) and 'Nein' (no), to indicate a combination of the two. Jailtacht (from English jail and Gaeltacht, "Irish-speaking region"): the community of Irish-speaking republican prisoners. Cantriz, from cantora (female singer) and atriz (actress), which defines women that both sing and act. Aborrescente, from aborrecer (annoy) and adolescente (teenager), which is a pejorative term for teenagers. Pescotapa, from pescoço (neck) and tapa (slap), which defines a slap on the back of the neck. Telemóvel, which means mobile phone, comes from telefone (telephone) and móvel (mobile). Cantautor, which means Singer-songwriter, and comes from cantor (singer) and autor (songwriter). A portmanteau common in both Hindi and English is Hinglish, which refers to the vernacular of the people in (the Hindi-speaking regions of) North India, where they mix Hindi and English in the spoken language. Another modern day example is the BrahMos missile, whose name is a portmanteau of two rivers, Brahmaputra and Moskva. Compounds displaying Sanskritic sandhi are extremely commonplace in Hindi, but as compounds showing sandhi still consist of multiple morphemes, these are not portmanteaus. There is a tradition of linguistic purism in Icelandic, and neologisms are frequently created from pre-existing words. For example, Tölva ("computer") is a portmanteau of tala ("digit; number") and völva ("oracle or seeress"). Golput: voters who abstain from voting, from Golongan Putih, "blank party" or "white party". Jagorawi: a motorway linking the cities of Jakarta, Bogor and Ciawi. Jabodetabek: the neighboring cities of Jakarta, consisting of Jakarta, Bogor, Depok, Tangerang, Bekasi, and sometimes Cianjur (Jabodetabekjur). "Malari": refers to "Malapetaka 15 Januari" – a social riot that happened on 15 January 1974. The inputs to the process can be native words, Sino-Japanese words, gairaigo (later borrowings), or combinations thereof. A Sino-Japanese example is the name 東大 (Tōdai) for the University of Tokyo, in full 東京大学 (Tōkyō daigaku). With borrowings, typical results are words such as パソコン (pasokon), meaning personal computer (PC), which despite being formed of English elements does not exist in English; it is a uniquely Japanese contraction of the English personal computer (パーソナル・コンピュータ, pāsonaru konpyūta). Another example, Pokémon (ポケモン), is a contracted form of the English words pocket (ポケット, poketto) and monsters (モンスター, monsutā). A famous example of a blend with mixed sources is karaoke (カラオケ, karaoke), blending the Japanese word for empty (空, kara) and the Greek word orchestra (オーケストラ, ōkesutora). Some Anime titles also are portmanteaus, such as Hetalia (ヘタリア). It came from Hetare (ヘタレ), which means "idiot", and Itaria (イタリア) which means Italy. Another example is Servamp, which came from the English words Servant (サヴァント) and Vampire (ヴァンパイア). A less-obvious anime example, attested mainly in a few URLs including a domain name, is Hagaren, from Hagane no Renkinjutsushi (鋼の錬金術師), the Japanese title for Fullmetal Alchemist. Although not very common in Spanish (except for a pair of compulsory contractions, 'a el'='al' and 'de el'='del'), portmanteaus are finding their way into the language mainly through marketing and media efforts, such as in Mexican Spanish 'cafebrería' from 'cafetería' and 'librería', or Teletón from 'televisión' and 'maratón'. However, it is very frequent in commercial brands of any type (for instance, "chocolleta", from "chocolate" + "galleta", cookie), and above all family-owned business (of small size, for instance: Rocar, from "Roberto" + "Carlos", and Mafer, from "Maria" + "Fernanda"). Such usages are obviously prompted by the registering of a distinguishable trademark, but with time is common that a specific trademark became the name of the all similar products, like in Cola Cao, a name which is very common to use to refer any similar product. Examples of a portmanteau in Spanish includes the word ofimática (office automation), a blend of the words oficina (office) and informática (computing). A somewhat popular example in Spain is the word Gallifante, a portmanteau of Gallo y Elefante (Cockerel and Elephant). It was the prize on the Spanish version of the children TV show Child's Play (Juego de niños)[better source needed] that ran on the public television channel La 1 of Televisión Española (TVE) from 1988 to 1992. In linguistics, the term blend is used to refer to the general combination of words, and the term portmanteau is reserved for the narrow sense of combining two or more morphemes in one morph. E.g. in the Latin word animalis the ending -is is a portmanteau morph because it is used for two morphemes: the singularity and the genitive case. In English two separate morphs are used (of an animal). While in Portuguese, French, Spanish and Italian the use of the short forms is obligatory (with the exception of ès in French, which is archaic in most senses), German and Cornish speakers theoretically may freely choose the form they use. In German, portmanteaus clearly dominate in spoken language, whilst in written language, both forms are in use. ^ a b "Portmanteau". Merriam-Webster Offline Dictionary. Archived from the original on 9 May 2008. Retrieved 21 June 2008. ^ "Portmanteau word". The American Heritage Dictionary of the English Language: Fourth Edition. 2000. Archived from the original on 26 November 2007. Retrieved 21 June 2008. ^ "portmanteau word". Webster's New World College Dictionary. Cleveland: Wiley. 2010. ISBN 0-7645-7125-7. ^ "Portmanteau word". Encyclopædia Britannica. Archived from the original on 15 December 2013. Retrieved 23 August 2013. ^ a b "What is a portmanteau morph?". LinguaLinks Library. 2003. Archived from the original on 19 June 2008. ^ Thomas, David (1983). "An invitation to grammar". Summer Institute of Linguistics. Bangkok: Mahidol University: 9. ^ Crystal, David (1985). "A dictionary of linguistics and phonetics" (2nd ed.). New York: Basil Blackwell: 237. ^ Hartmann, R.R.K. ; Stork, F.C. (1972). "Dictionary of language and linguistics". London: Applied Science: 180. ^ "portmanteau, n.". Oxford English Dictionary, third edition. Oxford: Oxford University Press. 2010. Retrieved 23 February 2011. ^ a b c Fromkin, V., Rodman, R., and Hyams, N. (2007) An Introduction to Language, Eighth Edition. Boston: Thomson Wadsworth. ISBN 1-4130-1773-8. ^ "Portmanteau." The American Heritage Dictionary of the English Language: Fourth Edition. 2000. ^ "PORTEMANTEAU : Définition de PORTEMANTEAU". cnrtl.fr. Archived from the original on 21 August 2014. ^ Such a "coat bag" is mentioned in Chapter 12 of Alexander Dumas' The Count of Monte Cristo. ^ Hill, Patrick (15 March 2014). "Inside 'Beckingham Palace': David and Victoria's mansion bought by insurance tycoon for £11.3million". Daily Mirror. UK. Retrieved 4 August 2018. ^ "NEW OXFORD AMERICAN DICTIONARY'S 2010 WORD OF THE YEAR IS..." Archived from the original on 16 January 2012. Retrieved 30 January 2012. ^ "Twist, Swing and Tango — it's the new Renault Twingo". MotorTorque.com. Archived from the original on 2 September 2014. ^ Zimmer, Benjamin (1 November 2005). "A perilous portmanteau?". Language Log. University of Pennsylvania. Archived from the original on 29 December 2008. Retrieved 11 November 2008. ^ a b Winterman, Denise (3 August 2006). "What a mesh". BBC News Magazine. Archived from the original on 16 December 2007. Retrieved 17 July 2008. ^ "The Daily Crossword". Nytimes.com. 28 June 2017. ^ Christine Byrne (2 October 2013). "How To Celebrate Thanksgivukkah, The Best Holiday Of All Time". Buzzfeed. Archived from the original on 9 October 2013. Retrieved 10 October 2013. ^ Stu Bykofsky (22 October 2012). "Thanks for Thanukkah!". Philly.com. Archived from the original on 14 October 2013. Retrieved 11 October 2013. ^ See p. 62 in Zuckermann, Ghil'ad (2009), Hybridity versus Revivability: Multiple Causation, Forms and Patterns, Journal of Language Contact, Varia 2 (2009), pp. 40–67. ^ "The Irish words for 'selfie', 'Brexit' and 'spam'". Irishtimes.com. ^ "Making sense of Brexit". Irishtimes.com. ^ "Slánaiste: Irish Times Letter Writers Have Their Say on the Political Crisis" (30 November 2017). The Irish Times. Retrieved from IrishTimes.com, 18 September 2018. ^ Spain, Cíara. "'Slánaiste' As Frances Fitzgerald Set To Resign - Radio Nova". Nova.ie. ^ "Champion of Irish Dancing & Naíonraí Has Passed Away". Cnag.ie. Retrieved 23 March 2019. ^ "The Irish translation of the Game of Thrones books are really, really literal". Entertainment.ie. ^ CHRÍOST, DIARMAIT MAC GIOLLA (23 June 2018). "Jailtacht: The Irish Language, Symbolic Power and Political Violence in Northern Ireland, 1972-2008". University of Wales Press. JSTOR j.ctt9qhjkk. ^ "A hora das cantrizes - ISTOÉ Independente". ISTOÉ Independente (in Portuguese). 4 October 2010. Retrieved 15 April 2018. ^ ""Consegui realizar meu grande sonho: ser cantriz!"". Tititi (in Portuguese). 20 February 2016. Retrieved 15 April 2018. ^ "O que é uma palavra-valise?". Kid Bentinho. Retrieved 15 April 2018. ^ "Significado de Aborrescente". Dicionarioinformal.com.br. Retrieved 15 April 2018. ^ ""Pescotapa" de Ciro Gomes repercute nas redes; apoiadores afirmam que vídeo foi manipulado - Brasil - BOL Notícias". Noticias.bol.uol.com.br (in Portuguese). Retrieved 15 April 2018. ^ "Significado de Pescotapa". Dicionarioinformal.com.br. Retrieved 15 April 2018. ^ "telemóvel - English translation – Linguee". Linguee.com. Retrieved 15 April 2018. ^ "Golput – Schott's Vocab Blog – NYTimes.com". The New York Times. 17 February 2009. Archived from the original on 9 February 2011. Retrieved 19 June 2009. ^ "What are contracted words like rimokon?". Sljfaq.org. Archived from the original on 4 October 2013. Retrieved 3 October 2013. ^ Rosen, Eric. "Japanese loanword accentuation: epenthesis and foot form interacting through edge-interior alignment∗" (PDF). University of British Columbia. Archived from the original (PDF) on 23 June 2011. Retrieved 25 November 2010. ^ "Gallifantes - RTVE.es". Rtve.es. 25 February 2011. ^ País, Ediciones El (4 June 1988). "Jugar bien vale un 'gallifante'". Elpais.com.